Apples are definitely the most prestigious fruit in the entire plant world. I mean, who isn’t familiar with the famous saying An apple a day keeps the doctor away? This widely popular fruit knows no cultural boundary or disrespect. From the earliest times, the properties and benefits of apples have been intensely advertised and apples have been viewed as some sort of wonder-fruit that ward off any kind of disease. They are said to contain phytochemicals that protect us from heart disease, diabetes and cancer. Apples are rich in flavonoids such as Quercitin, a potent antioxidant. Recent studies also show that the polyphenols found in apples can prevent blood sugar spikes that may lead to energy ups and lows and feelings of tiredness. Despite having little nutritional value, the fruit contain pectin, a natural compound that works against both diarrhea and constipation (see benefits of pectin). Moreover, apples are one of the few fruits easy enough on the stomach to be eaten when feeling sick. Scientists have proven only recently that apples bring important health benefits in terms of their impact on the flora of the digestive tract. Laboratory studies (on animals) have shown that eating apples can significantly modify the numbers of two bacteria in the large intestine: Clostridiales and Bacteriodes. As a result of the changes in the number of these bacteria, the activity of the large intestine is altered in a way that appears to be beneficial for the body. For instance, after apples are eaten, there is an increase in the levels of butyric acid, a sort of fuel for the cells of the large intestine. Quercitin is the main flavonoid found in apples and the highest concentration is in the peel of the fruit rather than in its pulp. There are many people who peel apples before eating them which, in many cases is not such a bad idea. If your are 100% sure the apples you are eating are natural (pesticide-free), then it is best you eat the skin of the fruit along with the pulp. If not, it wouldn’t be such a bad idea if you threw the skin away. After all, why willingly something that is not good for you? If you are lucky enough to get you hands on some real apples (usually those that grow in the coutnryside are more likely to be 100% natural), you will get to know how real apples taste like. Organic or natural apples not only taste good (genuinely sweet or sour, depending the the variety), but they also have a strong fruity aroma. As with many other fruits, you can smell the real ones. Not to mention that organic or natural apples have, besides a few vitamins and minerals, a decent quantity of phytochemicals and antioxidants. When apples have a red peel, it can only mean that they are rich in anthocyanins which are basically natural antioxidants highly beneficial for cardiovascular health. Most of the polyphenols found in apples act as strong antioxidants, which is why many scientific studies assert the fact that apples are highly beneficial for our health. What is indeed surprising is this fruit’s ability to reduce fat oxidation within the cell membrane, which has benefits for cardiovascular health and general well being. Different colors in apples also indicate the presence of different antioxidants, from chlorophyll in unripe, green apples to carotenoids in yellow ones and anthocyanins in ripe red and dark red apples. 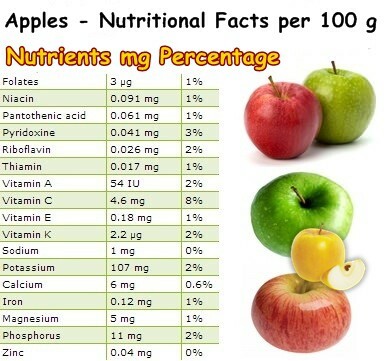 If you take a look at the nutritional table below, you’ll notice apples have some vitamin C and the famous pectin, but they barely have any B complex vitamins or much of any essential vitamins or dietary minerals. Overall, they are very low in nutrients and the only health benefits they bring us are a result of their phytochemical and fiber content. Yet they have some really great health benefits. 1) Fresh apples are good for nausea thanks to their content of malic acid. 2) Applesauce made from boiling apples is a great food to eat for nausea and diarrhea. 3) Apples combat diarrhea and constipation. The pectin in the fruits skin helps bind stools that are too loose and soften stools that are too hard. 4) Boiled apples and plain applesauce are easy on the stomach, great for gastritis flare-ups in moderate amounts (read more about the best and worst foods for gastritis). 5) The pectin in apples has regenerative properties, helping the stomach lining heal from gastritis ulcers. 6) Eating apples combats scurvy, despite having a low vitamin C content. 7) Eating apples cleans teeth thanks to malic acid which helps dissolve food particles, but can also sensitize teeth. 8) The more sour the apple, the higher its vitamin C content. 9) Apples have a tonic, invigorating, rehydrating effect. 10) Eating an apple can curb sugar cravings. Conclusion. It’s somehow curious how eating apples can be good for you seen the low amounts of vitamins and minerals the fruit contains. However, the pectin, malic acid and antioxidants in the fruit provide multiple wonderful and meaningful health benefits, making the apple a good food to eat if you are dehydrated or have diarrhea, constipation, sugar cravings, low mood, low energy levels and nausea.